Josh_R apologizes for the lack of updates regarding the ND Hockey team. His jobs have consumed his life lately. For much of the 2008-2009 NCAA hockey season, the main question asked by fans, the media, and even ND’s opponents was not “if” Notre Dame would take the CCHA regular season crown, but “when.” As the team’s excellent play continued, the points gap separating ND from the rest of the CCHA field increased. By the end of the season, one could only wonder that it wasn’t a question of if Notre Dame would also take the Mason Cup in Detroit as the CCHA Tournament Champion, but when. After enjoying the bye weekend, Notre Dame faced CCHA #8 Nebraska Omaha at the JACC. UNO was coming off a fairly easy weekend against CCHA #9 Ferris State, as they swept the Bulldogs with a 3-0 win on Friday and a 5-1 win on Saturday to advance to the second round of the CCHA tournament. Read the rest at Rakes of Mallow. The Irish came out as the victors in the game between Notre Dame and the University of Michigan, predominantly played in a monsoon for much of the second half, 35-17. But even with such a win, all of the skeptics out there, the media, and perhaps even some of us fans are still asking, Is Notre Dame really back? Finishing was the prevalent theme in Saturday’s rain-soaked event. The team was able to finish on given opportunities. Many already are attributing Notre Dame’s win to the plethora of Michigan miscues (and there were MANY) as the true, all encompassing reason for the result. I guess six turnovers can do that, as well as 79 yards in penalties. 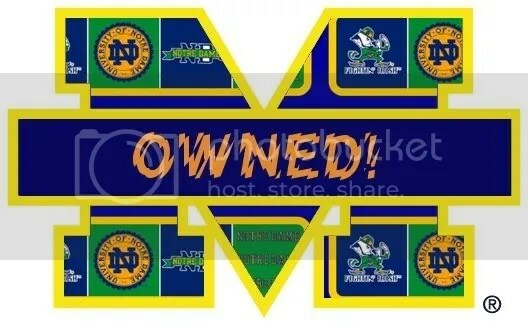 As can Notre Dame’s 28 points off those turnovers. But this is the thing. Last year’s team would not have scored 28 points off of turnovers. I’m sure I wasn’t alone in thinking that we wouldn’t be able to capitalize on the opportunities given by the Michigan offense and special teams. But we did. How many times did gifts like this result in a field goal, or even more commonly, a missed FG or a turnover of our own? There was a visible difference in our defensive scheme, as typically the instituted 3-4 doesn’t provide a favorable match up against Michigan’s spread offense. We went to a 4-2-5 arrangement, and it definitely helped neutralize the attack. We saw a zone defense for most of the game, and UM QB’s Steven Threet and Nick Sheridan were able to complete 19 passes out of 28 for 229 yards. That’s pretty good I would say against this style of offense, which tries to capitalize by running routes into anticipated holes in the zone coverage. But of course by spreading out the DB’s and LB’s, the run defense can be compromised. Here, ND did an ok job, not giving up the big play that could have ultimately changed the momentum of the game in UM’s favor. I was impressed by freshman running back Sam McGuffie, and his elusiveness, power and speed. 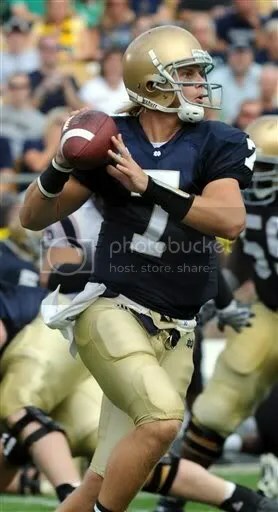 If he manages to stay healthy, he could prove to be in a class of his own in not only the Big Ten, but perhaps all of D1. He has the makings of someone special, as he ran for 131 yards on 25 attempts. 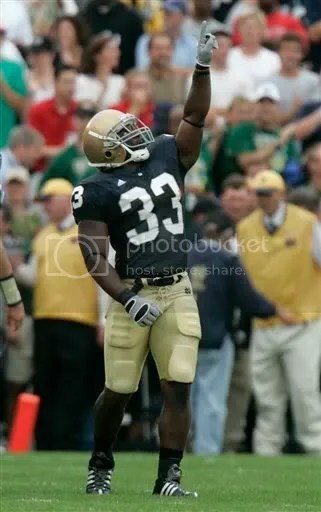 He is also a receiving threat out of the backfield as he caught 4 for 47 yards, including Michigan’s lone TD pass, a quick 40 yard pass in the middle where McGuffie managed to elude a good 5 ND tackle attempts while bouncing off his own lineman and into the endzone. The offense continues to gel, and you can just feel a strong sense of oozing confidence from this group. Clausen is maturing quickly and becoming a vocal, and most importantly, a respected leader. Though the first two drives weren’t exactly 80 yarders, an extremely short field can be just as challenging, because of the obvious emotional spark, which can be hard to quell. Their ability to calm down and FINISH lead to a quick 14-0 lead. That Clausen-Tate connection is starting to raise some eyebrows. Off a Michigan turnover on downs, Clausen threw a bomb to Tate and a quick 48 yard score. Oh, and did we mention Clausen was sacked 0 times again. Last season at the big house? Clausen was sacked 8 times. Kudos, O-Line. But we were able to pound it on the ground as well. 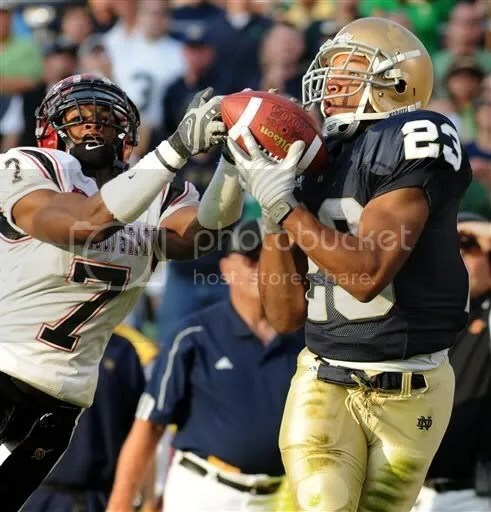 Though ND only rushed for 120 yards, the backs secured the ball, fumbling 0 times, and controlling the time of possession. Robert Hughes was the leading rusher with 79 yards on 19 carries with 2 rushing TD’s. The special teams were great once again, the kick and punt coverage was spectacular. Maust had 6 punts. 2 were downed inside the 20 and he had an average of 43.8, providing a valuable advantage in field position, especially with the way the weather was. Overall, I felt we played a solid game, and ANY win against Michigan is worth extolling. What scares me is the rushing defense. They really haven’t been tested and Michigan State’s running back Javon Ringer as well as their athletic offensive line pose a sizable threat. 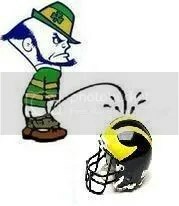 I’m sure Charlie and Co. will be ready for their tough road opener in East Lansing. 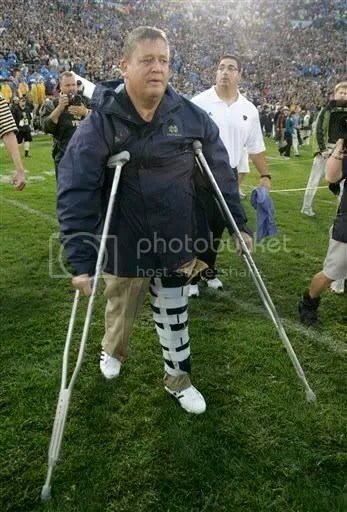 And if you haven’t heard, head coach Charlie Weis tore his ACL and MCL. He would probably be out for the season if he were a player. He definitely was on some good stuff in the second half as he looked glazed over. I’m sure he needed it after insisting on staying on the field coaching with a full leg brace and on crutches. What a coach. Talk about FINISHING. We’re 2-0, and on a streak of 4. Let’s keep it going, and let’s get some respect by beating MSU!